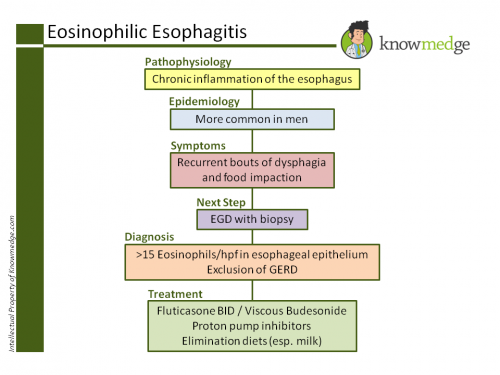 Eosinophilic esophagitis may be a topic that falls into the Gastroenterology and Hepatology section of the ABIM syllabus. But given that it’s becoming more common due to the parallel increasing incidence of allergic disease and asthma, it’s a diagnosis that allergists manage. Dr. Charles Feng, Knowmedge’s allergy specialist, presents recent research showing that baked milk may provide an alternative for patients experiencing milk-mediated eosinophilic esophagitis. Cow’s milk is one of the most common foods causing Eosinophilic Esophagitis (EoE), and elimination is effective in resolving the disease. But adherence to such a diet is challenging because it is in so many processed foods. A 2011 report in the Journal of Allergy and Clinical Immunology showed that 75% of children with IgE-mediated hypersensitivity, resulting in symptoms such as angioedema, urticaria, shortness of breath, and GI symptoms, to cow’s milk tolerated baked milk products. Now, in another Journal of Allergy and Clinical Immunology article published in November 2013, researchers from Massachusetts General Hospital (MGH) wanted to see if patients with cow’s milk mediated EoE tolerated baked milk. To this end, using a retrospective chart analysis, the authors identified 15 patients with biopsy-proven EoE and who elected to undergo baked milk ingestion for at least 6 weeks, defined as eating 3-4 servings per week of home-baked and/or store bought baked milk products, including bread, muffins, cakes, and brownies (please enroll me in this study!). Ingestion of cheese, including that found on pizza, was excluded. The primary endpoint was histological remission during baked-milk ingestion, defined as eosinophil counts less than 10 per high-powered field found on endoscopic biopsy. The results were interesting. 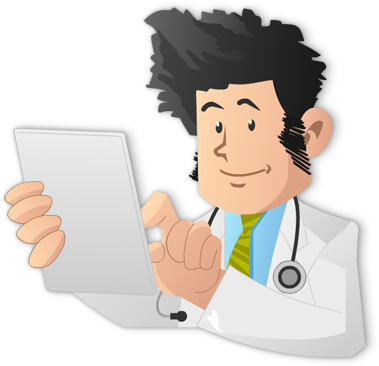 11/15 patients maintained histologic remission, while 4 patients had disease recurrence. Of the 11 baked-milk tolerant patients, 10 had normal endoscopic findings and one patient had furrowing on endoscopy that was also present with complete dairy elimination, despite complete resolution of symptoms. All 11 patients remained asymptomatic while ingesting baked milk regularly. Of the four patients with histologic recurrence of EoE on a baked milk diet, 3 of the 4 patients experience symptoms including abdominal pain and dysphagia. The etiology of EoE is thought to be caused by an antigen-specific allergic immune response. The destruction of conformational epitopes of cow’s milk may be the underlying mechanism allowing baked milk tolerance in patients with cow’s milk hypersensitivity. The results show that baked milk is tolerated in a subset of cow’s milk sensitive EoE patients. Unfortunately, skin prick testing, patch testing, and specific IgE blood testing were not helpful in predicting the outcome of baked milk ingestion, so we don’t know who this intervention would be most effective for. Also, the study is limited by its retrospective nature and small sample size. A prospective study is needed before these results can be broadly applied to clinical practice. Now that you’re up to date on the latest milk-induced EoE research, let’s review the topic of EoE, as relevant for the ABIM boards, NBME shelf exam, and the USMLE Steps with an exclusive Knowmedge slide.